It was 11 p.m. on Christmas Eve, 1997. My Dad embarked on a solo mission to the garage to assemble a basketball hoop for my brother and I. Armed with a tool kit, a set of instructions, and the kind of confidence you get from a neighborhood Christmas Eve party, he was ready…or so he thought. Around 1:30 a.m., he had assembled the entire hoop. Backwards. Next steps were taking apart the hoop, waking up my mother, and reassembling. They finished in time (4 or 5 a.m.) to get about an hour of sleep before we woke up, and Santa got all the credit. Have you ever been totally frustrated by a how-to, online or offline? There’s nothing more frustrating than trying to follow instructions or a tutorial that doesn’t do a great job of explaining how to do something. You may even end up abandoning the project, and worse, harbor a bit of resentment towards the people/company who made such terrible instructions in the first place. To avoid being the target of someone’s wrath because you’ve written poor instructions, this post is here to guide you through creating a how-to that guides people from start to finish with minimal frustration. Remember, most people “read instructions when they are impatient, fatigued, or even terrified” (see above Christmas Eve anecdote). Consider your audience. If you’re writing a how to for the general public vs. a specific task for an employee, your instructions will probably look a little different (assuming the employee has some industry/insider knowledge, compared to a random person on the street who probably has no idea what you do). Introduce the objective/end goal. What is the end result a person should have at the end of these instructions? This can just be one or two sentences, nothing crazy. List all materials. This is the place where it’s important to be thorough and organized. For instance, if your product is a model airplane, include a list of a) materials included and b) additional materials needed before starting the project. If there’s something that would make the project easier, but isn’t necessary, include it in a “recommended materials” list. Write instructions as commands. I’m guilty of slipping into passive voice, but when it’s time to give instructions things like “and then you will want to…” or “it should look like…” don’t instill a lot of confidence. People are looking to you for direction, so don’t be afraid to sound bossy. Don’t get jargon-y. You know what people hate, especially when they’re trying to figure out how to do something? Feeling dumb. If you’re writing instructions that include a lot of jargon or words that people who don’t work in your industry will understand, it’s probably going to be more frustrating than helpful. If you do need to use industry terms to explain something (or name a part, for instance), include a picture showing what it is exactly (you may be surprised how many people find this helpful). Speaking of visuals, these can be a great thing to include in your how-to (especially since we’re assuming you aren’t using video here). Even in your list of materials, depending on what they are, could include a visual next to each item showing what it looks like. If it’s an assembly project, showing the progress after each completed step assures people as they’re moving through the instructions that they aren’t just blindly going about things and hoping it comes out the way it’s supposed to at the end. Have someone else read through. 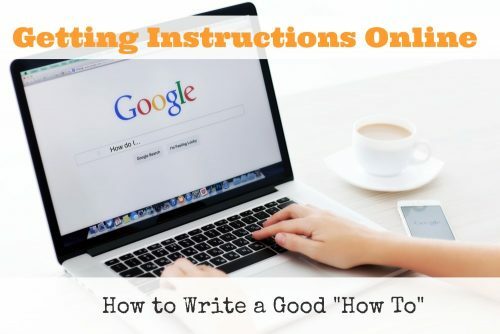 Chances are, if you’re writing instructions about something, you are already fairly good at it. Having someone who’s less familiar with the process, or at least some degree of separation, could provide a bit of insight toward where your instructions are unclear. If you can’t get an extra set of eyes, wait a day or so and try to follow your own instructions from scratch, taking notes on areas that could use more clarification.